As you may know, first impressions are important. Naturally as humans we size-up someone based on a number of factors that we then attach to our initial impressions of that person. In football we do the same. Height, weight, speed, stamina, strength, agility. But at the 2019 CFL National Combine it’s the final impression that is of upmost importance. The impression that the prospects want CFL scouts to remember them by. On Mar. 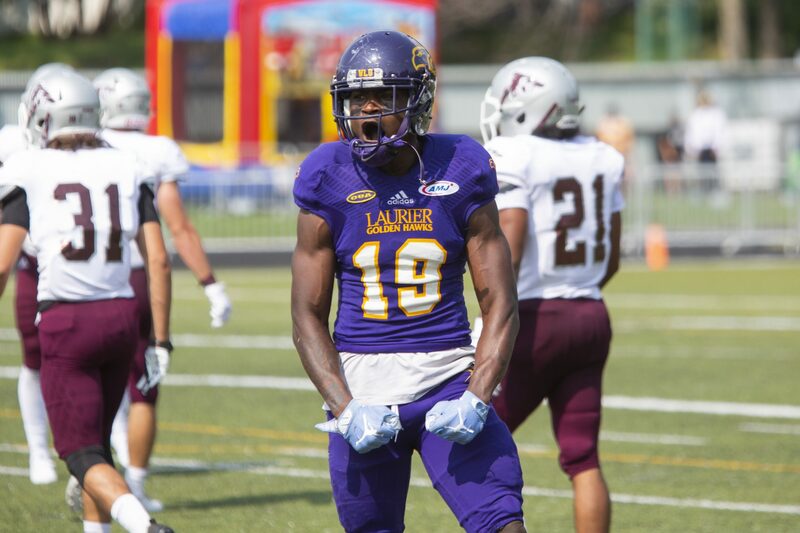 22-24, two Wilfrid Laurier University Golden Hawk men’s football players had a chance to give their final impression for the CFL talent evaluators at the Canadian Football League (CFL) 2019 National Combine in Toronto. This event is the final chance for the nation’s top amateur football prospects to showcase their dynamic skills, dauntless power and refined performance before the CFL Draft Day on May 2. Golden Hawks receiver Kurleigh Gittens Jr., and defensive lineman Robbie Smith scored direct invitations to participate at the National Combine. Both athletes had strong showings throughout the weekend that will only add to their already impressive football resumé, including winning the 2016 Men’s OUA Football Championship. Gittens Jr. and Smith, who are both fourth-year athletes, had enormous seasons since joining the Golden Hawks in 2015. Their season stats do nothing but prove why they are top prospects for the CFL. Both Gittens Jr. and Smith have done all they can to prove why they deserve to step off the University Stadium field and onto the professional stage. With their final impressions given the only thing left to do is to wait to see what happens on Draft Day. Alongside Gittens Jr. and Smith were eight other members of the Golden Hawks men’s football team who were invited to participate at the Regional Combine Thursday night, but unfortunately did not get to move on to participate at the national level. The CFL National Combine consists of measurements and medicals of each player followed by two days of athletic performance testing. On Saturday the athletes perform the vertical jump, and bench press at the Goldring Centre for High Performance in Sport. Then on Sunday they engaged in the 40-metre dash, shuttle, three-cone drill, broad jump, and finished off the day with individual drills and one-on-ones at the Varsity Stadium bubble. Gittens Jr. and Smith both put up impressive numbers and had their own standout moments throughout the weekend. Gittens Jr.’s 40-metre dash time of 4.62 seconds was third among all participants in attendance, and Smith’s 36-inch vertical jump was the best for a defensive lineman since Stefan Charles back in 2013. Smith also hit an impressive 23 reps in the bench press. Smith has been compared to the likes of former Golden Hawk Kwaku Boateng, who is now a defensive end for the Edmonton Eskimo’s, and has also been linked to Laurier alum Ese Mrabure, now defensive lineman for the Calgary Stampeders. Smith is projected to be a first round draft pick this year.